Xiaomi’s next grand unveiling is taking place on July 27. The company has informed the media about this conference that will be held at China National Convention Center in Beijing. You can see the invite in the image to the left, but it doesn’t hold any clues as to what exactly will be introduced on that occasion. 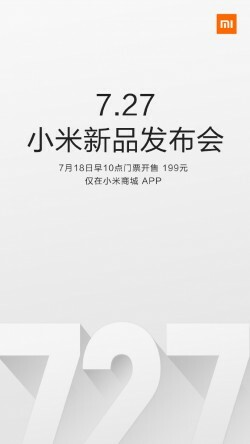 Thankfully however, Xiaomi’s director of new media has revealed via his Weibo account that not one but two products will be made official on July 27. He didn’t name either one, of course, but did give us some clues as to what they are. See, he ‘redacted’ their names, thus revealing how many characters each has. And it looks like the recently leaked Redmi Note 4 with its dual-camera setup on the rear and Helio X20 SoC will be present at the conference. And so might the much-rumored Xiaomi laptop, which could end up being called Mi Notebook. This will come with an Intel Atom processor and at first will be offered in two sizes – 12.5″ and 13.3″. It will have a light aluminum body, and should somewhat resemble Apple’s MacBook line in terms of looks. At some later point we are apparently going to see a 15.6-inch version of the laptop too.